The 2007–08 FA Cup was the 127th season of the world's oldest football knockout competition, The Football Association Challenge Cup, or FA Cup for short. A record 731 clubs' entries were accepted for the competition. The competition culminated with the FA Cup Final, held at Wembley Stadium, London on 17 May 2008. 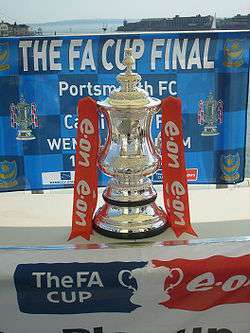 The match was contested by Portsmouth and Cardiff City, with Portsmouth taking the title 1–0, Nwankwo Kanu scoring the winning goal. Leeds United, now a third tier side, made their earliest ever entry to the FA Cup and suffered a surprise 1–0 home defeat to Hereford United in the replay that followed a goalless draw. For the second round in a row, the only all-Premier League tie of the round involved Manchester United, who were defeated at home by Portsmouth. Barnsley, who had already knocked out Liverpool in the previous round, produced a similar result in the Sixth Round, beating Chelsea 1 – 0 at Oakwell. West Bromwich Albion defeated Bristol Rovers away at the Memorial Stadium, whilst Cardiff City caused a third shock of the weekend by beating Premier League team Middlesbrough. The Sixth Round matches were played on the weekend of 8 March 2008. For more details on this match, see 2008 FA Cup Final. ↑ "Gloucester star wins FA Cup award". BBC Sport. 27 September 2007. Archived from the original on 4 January 2008. Retrieved 2008-01-03. ↑ "Team Bath star wins FA Cup award". BBC Sport. 11 October 2007. Retrieved 2008-01-03. ↑ "Eastleigh hero wins FA Cup award". BBC Sport. 23 October 2007. Retrieved 2008-01-03. ↑ "York striker claims FA Cup award". BBC Sport. 12 November 2007. Retrieved 2008-01-03. ↑ "Terras striker wins FA Cup award". BBC Sport. 21 November 2007. Retrieved 2008-01-03. ↑ "Mackail-Smith scoops FA Cup award". BBC Sport. 10 December 2007. Archived from the original on 27 December 2007. Retrieved 2008-01-03. ↑ "Coventry hero earns FA Cup award". BBC Sport. 14 January 2008. Archived from the original on 15 January 2008. Retrieved 2008-01-14. ↑ "Havant's Potter wins FA Cup award". BBC Sport. 4 February 2008. Archived from the original on 31 January 2008. Retrieved 2008-02-05. ↑ "Barnsley keeper wins FA Cup award". BBC Sport. 27 February 2008. Archived from the original on 25 February 2008. Retrieved 2008-02-27. ↑ "Odejayi takes vote". TheFA.Com. 18 March 2008. Retrieved 2008-03-20. ↑ "Ledley takes the vote". TheFA.com. 14 April 2008. Retrieved 2008-04-15. ↑ "Fourth Round draw". TheFA.com. 7 January 2008. Retrieved 2008-01-26. ↑ "No draws!". TheFA.com. 28 January 2008. Retrieved 2008-01-28. ↑ "Fifth Round draw details". TheFA.com. 25 January 2008. Retrieved 2008-01-26. 1 2 "Sixth Round draw". TheFA.com. 15 February 2008. Retrieved 2008-02-16. ↑ "Semi-Final draw". TheFA.com. 8 March 2008. Retrieved 2008-03-09. ↑ "The Magic of The FA Cup". TheFA.com. 9 March 2008. Retrieved 2008-03-09.